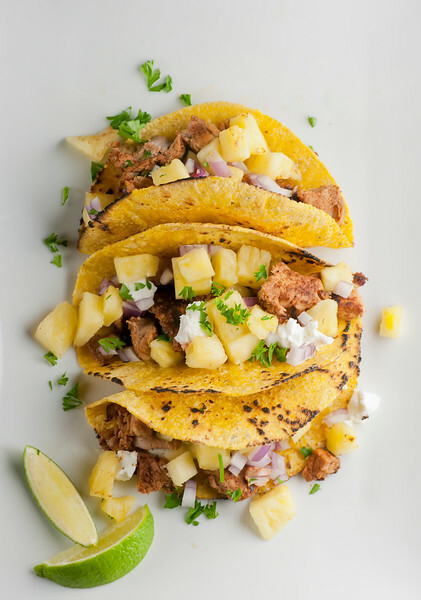 This recipe for pineapple pork tacos came from my perverse love for all things summery and tropical in the middle of winter. (This also works in reverse, when I crave beef barley soup in the middle of July. At least I’m consistent!) Anyway, the good news is that unlike when I get a hankering for ripe local tomatoes in January, which is never going to happen, all the ingredients for pineapple pork tacos are just a trip to the supermarket away. And since this is made with pork tenderloin, which is the only cut of pork that I am reliably good friends with, it’s also quick. And scrumptious. Feel like some tropical supper tonight? Let’s make some! I do love fresh pineapple with this recipe, and these days supermarkets do have them all year round. Click here for the easiest way to wrangle a pineapple (it’s not hard, I promise). Did you also know that the pineapple is a sign of welcome? That’s why you see pineapple doorknockers on so many houses. If you can’t find a fresh pineapple, the canned kind will work just fine – try and find chunks packed in juice instead of syrup. The first step is to cut your pork tenderloin into chunks and marinate it in a nice bath of apple juice and chili powder. Yep, sweet and zingy all at the same time. You can do this in the morning and when you are ready for dinner your pork will be all nice and marinated…but if you forget, as long as it sits in the marinade for about an hour you will be fine. Now cut it into bite size chunks and sear it in a little olive oil until it’s done. 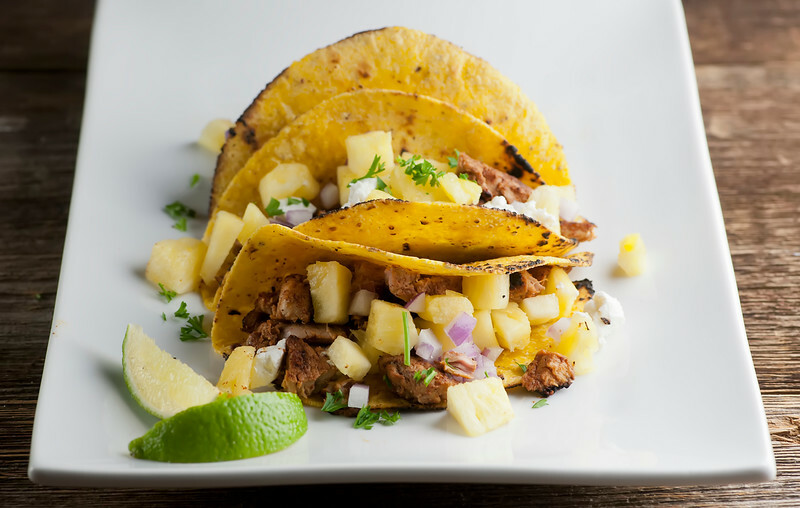 Now all you need to do is pop the pork chunks into some warm corn tortillas and top them with a mixture of pineapple, chopped shallots, parsley and a little goat cheese. You can warm the tortillas in the microwave or in your oven, but my favorite way to heat them up is to brush them with a little olive oil and lay them directly on my gas burner on the stovetop over low heat. After a minute I flip them with tongs, and then I give them another minute. Not only are they warm and toasty, but they have nice little char on the outside as well. All that’s left to do is pop them on a plate with some lime wedges – squeeze the lime juice over the top right before you take that first bite. Tropical! Mix together apple juice and chili powder. Put pork chunks into a plastic zippered bag and pour apple juice mixture over them. Marinate in the fridge for one hour to overnight. When you are ready to make the tacos, mix together the pineapple chunks, the parsley and the shallots. Set aside. Heat oil in a large skillet over medium high heat. Add pork chunks, discarding marinade, and cook until done, about 8 minutes. Season to taste with salt and pepper. Heat tortillas, and assemble as follows: generous spoonful of pork, topped with pineapple mixture, and some goat cheese. Serve with lime wedges on the side. These pork tacos look fabulous! I just love mixing fruit with savory and salty, and pineapple is a great choice. I’m hungry now! Mmm pineapple tacos?! Why have I never tried this before? My husband and I love switching up our tacos, so we;ll definitely have to try this out! One day I am going to plan a week of tacos and actually DO it! Okay, I wish I were like you. The only seasonal flavor I crave year-round is ice cream. Other than that, soup and tea are for winter! Though you know, I could get down with some taco love right now. I’m psyched that you used pineapple! Oh, I’m right there with you on the ice cream, Mir! Pineapple also reminds me of summer! What a great idea to have it in tacos! Pineapple and pork always go so well together! Pineapple in January is like having a little summer in winter, right? a few years ago, i would’ve said that apples were the best fruit to pair with pork, but now i’m not so sure. pineapple seems to be even better!